Our range of TV ceiling mounting brackets are suitable for domestic, retail and commercial installations. 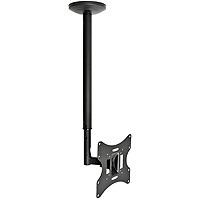 Heavy Duty TV Ceiling Mount Bracket for most 39 to 55 inch Flat Screens This strong telescopic TV ceiling mounting bracket with swivel and tilt adjustment is ideal for domestic, commercial or retail CCTV monitor installations. Suitable for TV's with up to 400 x 400mm mounting holes. Model: PLBCE94402S. White Heavy Duty TV Ceiling Mount Bracket for most 39 to 55 inch Flat Screens This heavy duty TV ceiling mount is specially finished in white to match most ceilings. It has an adjustable length pole, making it perfect for flat panel television and commercial CCTV monitor installations. Suitable for TV's with up to 400 x 400mm mounting holes. Model: PLBCE94402SW. 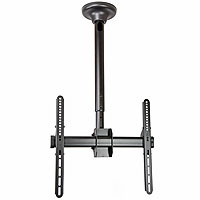 Tilt & Swivel TV Ceiling Mount Bracket for most 23 to 42 inch Flat Screens This popular telescopic TV ceiling mounting bracket with swivel and tilt adjustment is ideal for domestic, commercial or retail CCTV monitor installations. Suitable for TV's with up to 200 x 200mm mounting holes. Model: LCD504A. 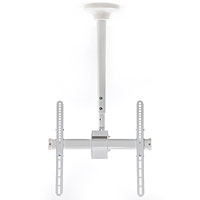 White Telescopic TV Ceiling Mount Bracket for most 23 to 42 inch Flat Screens Finished in white to match most ceilings, this popular TV ceiling mounting bracket suits most 23-42 inch flat screens with up to 200x200 VESA fixings. Model: LCD504AW.